Microsoft unveils Windows Phone 8.1 update. The major features include digital assistant with a persona based on Halo's artificially intelligent character called Cortana. With Windows Phone 8.1, developers ’ve added a BUNCH of new features that make the smartphone even more a reflection of your personality and desires: Action Center, customizable lockscreens,Word Flow Keyboard,new Skype app ,weather is integrated calender,higher-fidelity feeds for people hub,updated Camera UI and burst mode. Data Sense, Wi-Fi Sense, Storage Sense, and Battery Saver. "Of everything we’re announcing today, I’m most excited to introduce you to the world’s first truly personal digital assistant, now on Windows Phone. We were inspired by the popular character from Halo who served as a brilliant AI and a deeply personal digital assistant to Master Chief… so we called her Cortana." 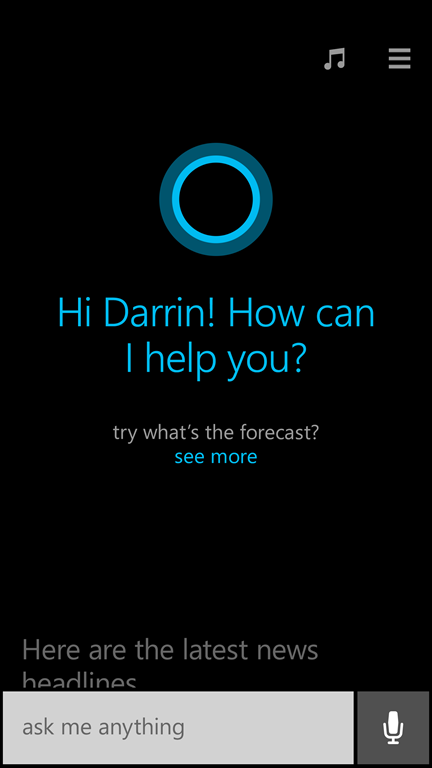 In Windows Phone 8.1, you get to Cortana by either a Live Tile on your Start screen or by pressing the search button on your device. This will take you to Cortana Home. To interact with Cortana, you can either speak or type—if you’re in a meeting, just type and Cortana won’t talk out loud. But if you ask her a spoken question, she’ll answer verbally and even carry on a natural conversation. When you interact with Cortana for the VERY first time, she will start learning things about you... like your name, how to pronounce it, and ask for some personal interests. 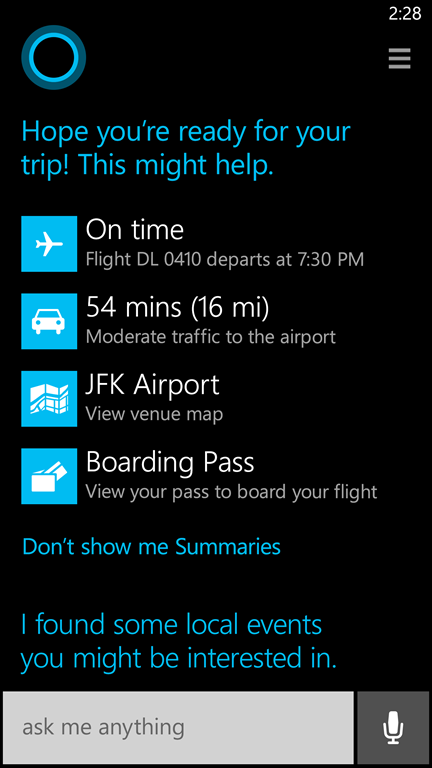 Once she’s learned a bit about you, Cortana’s home populates with information that is curated just for you. You’ll see things like flight information she’s found from your email confirmations, weather, the latest news, and even traffic information once she learns your commute routine, such as from work and home. As for when owners of existing Windows Phone handsets can expect the update to arrive on their devices, Microsoft said only that it is working with carriers and hardware makers to ensure the code is reliable on each device, and that Windows Phone 8.1 will begin rolling out to consumers as an over-the-air update "in the next few months."